You've joined us on our picks. You've climbed trees and washed lemons and boxed oranges. But what happens to the fruit once it leaves our hands? 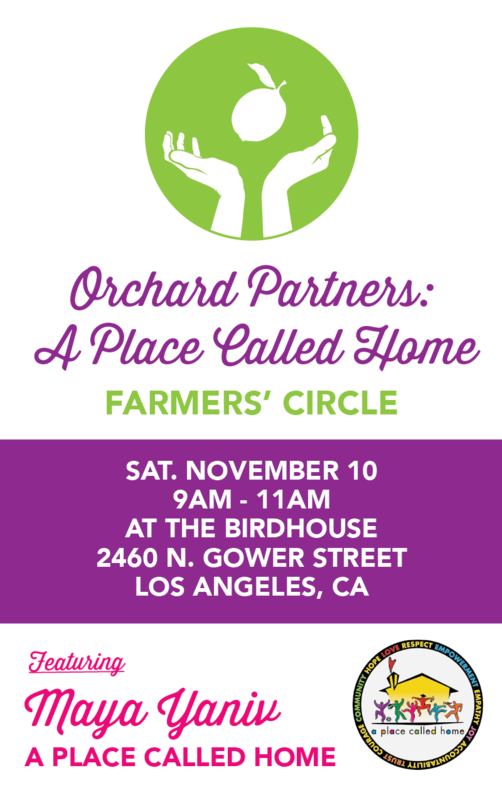 Please join us on Saturday, November 10 for a very special Farmers’ Circle featuring Maya Yaniv from A Place Called Home (APCH). APCH provides children and teens in South Central with educational and enrichment opportunities, including tutoring and homework help, dance, music and visual art and, of course, growing food! If you're familiar with Hollywood Orchard then you know that throughout the year we donate the majority of the fruit we pick to APCH. But our partnership with them is much deeper than just acting as a place to bring surplus fruit—they are in fact at the very core of our mission. Our picks revolve around trying to better serve their needs, and the trees we’ve planted and care for were selected with the idea of growing a year-round crop to share with them. We give them the fruits of our labors, but they give us back so much more. They provide us with an intimate connection to the heart of this amazing place that we call home. Maya manages the organic vegetable garden and nutrition initiatives at APCH. In the garden, children have an opportunity to get in touch with nature and grow healthy, fresh food. In addition to growing food on about a quarter acre divided between three sites in South Central LA, the department also cooks and serves hundreds of meals on a daily basis. The most requested item is, of course, fresh fruit. For many of the participants this is the first time they've ever tasted persimmons, jujubes, or blood oranges. And when we’ve been lucky enough to have a vanload help with one of our picks, the joy is infectious. Come hear about the great work that Maya does and help us continue to strengthen the bond between our Hollywood Orchard community and A Place Called Home. We’ll be serving hot coffee and baked goods, and we look forward to spending the morning with you. This event is located at 2460 N. Gower Street in Beachwood Canyon, Los Angeles. Parking is very limited. If you must drive, please park on Beachwood Drive.